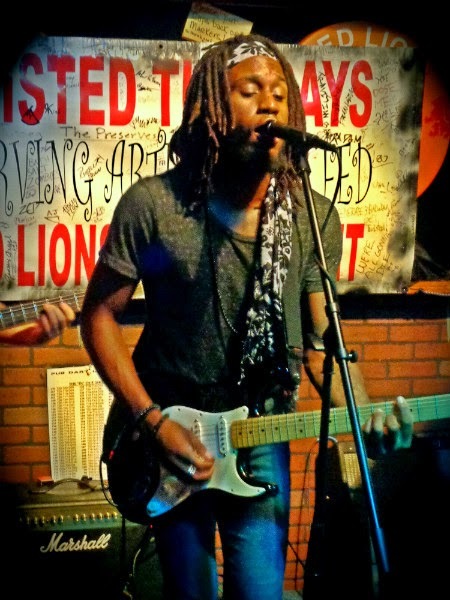 Last Tuesday, I caught up with Evan Taylor Jones for a long-awaited interview at the Red Lion Pub. That night he played with his band — Tyler Hood (guitar), Cris Faustmann (bass), Omar Rodriguez (drums), Mikey Guzman (keys), Matt Gutkin (organ, synth) — and was accompanied by Christian Ryan on saxophone. Last year, Evan released his debut album and played over 100 shows in the state of Florida. He is well on his way to topping that number this year, having already played 23 shows in May at the time we spoke. Listen to the brief interview, where he talks about what keeps him going in the face of such an intense tour schedule and what he hopes you will gain by listening to his music. Catch Evan on tour at the Ocean Deck Beach Bar Summer Festival in Daytona Beach on Saturday, June 7. Jump on the bus for "ETJ's Fantastic Voyage" and get to the event in style with unlimited free drinks for just $25. Pay a little more to get the album or an album and a shirt. You can also pick up Songs From an Old Soul on iTunes. Evan will be back in Orlando playing at Bombshell's Tavern on August 8. What other local artists would you like to hear more about? Comment below or like Live Music Is Evolving on Facebook to give your feedback. You can also subscribe to get a weekly update sent straight to your inbox.